EPA’s Scott Pruitt leaves his mark on businesses, but will it last? Fri., July 6, 2018, 10:58 a.m.
As head of the Environmental Protection Agency, Scott Pruitt tried to roll back rules affecting many industries, but whether he made lasting changes in the government’s regulation of business or failed to leave a legacy could be decided in the courts. 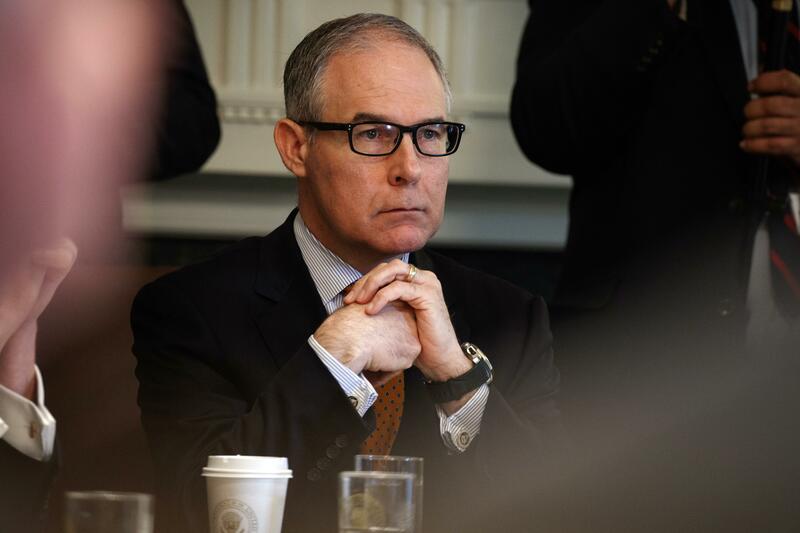 Pruitt, a former Republican attorney general in Oklahoma, resigned suddenly Thursday amid ethics investigations into lavish spending on first-class airline travel and using his office to seek jobs for his wife. Industry groups praised Pruitt for reducing their regulatory burden in his short time in office. “We appreciate Scott Pruitt’s hard work to promote smarter regulations and streamline the permitting process,” said Michael Tadeo, a spokesman for the American Petroleum Institute. There is little indication that interim replacement Andrew Wheeler, Pruitt’s deputy at the EPA and a former coal-industry lobbyist, will take any different approach to policy matters – Trump said as much in another tweet. Environmentalists, however, are confident they will prevail in court challenges to Pruitt’s most controversial moves including those affecting coal, auto emissions and agriculture. – COAL: Pruitt tried last year to repeal a key climate-change regulation of President Barack Obama’s administration. The Clean Power Plan aimed to cut carbon dioxide emissions from coal-fired power plants nearly one-third by 2030. A replacement proposal from EPA is expected this summer. EPA also said it was rewriting rules governing pollution from coal ash, a coal-power-plant waste byproduct that contains toxic heavy metals. The move was praised by utilities and opposed by environmentalists. – MINING: The EPA said last year that it won’t require mining companies to prove they have the financial resources to clean up pollution, an Obama-era rule stemming from a long history of pollution spilling from abandoned mines into streams. Pruitt said modern mining practices and existing regulations made the financial requirement unnecessary and a burden on mining. – AUTOS: Pruitt’s EPA has proposed freezing vehicle fuel-efficiency standards at 2020 levels for the next five years, according to a draft of the proposal obtained by Sen. Tom Carper, D-Del. For new vehicles, that means an average of about 30 miles per gallon instead of rising to 36 mpg by 2025 as Obama’s EPA proposed. – OIL AND GAS: More than a dozen states are suing the EPA for failing to take action against leaks of methane, a powerful greenhouse gas that contributes to climate change, from oil and natural gas wells. Last year, a federal appeals court ruled that Pruitt overstepped his authority in trying to stall an Obama-era rule requiring companies to monitor and reduce methane leaks. – AGRICULTURE: In March 2017, a month after becoming EPA administrator, Pruitt delayed consideration of banning usage of a widely used pesticide, chlorpyrifos, on food crops for at least five years. The pesticide has been banned for household use since 2001, but agriculture groups want to keep using it. This February, Pruitt suspended for two years an Obama-era change – in legal terms, the definition of “waters of the United States” – that would expand protection of streams and wetlands and hold farmers and developers responsible for runoff pollution into streams on their property. Published: July 6, 2018, 10:58 a.m.